These words indicate boundless love and trust a wife has for her husband. She is ready to beg for a living than to be “the greatest queen in Christendom”. This shows that the passion and love she has for her husband well enough to assure that he loves her with equal passion, or mare. But the million dollar question is that who is or rather was the woman, who told these golden words? She mothered two children rumored to be the bastards of King Henry VIII of England, she was the maternal aunt of Queen Elizabeth I, one of the greatest and influential monarchs of England; she was the sister of one of the most ill-fated Queen consort England ever hand and cousin of another; she laid the foundation for the rise of her family but was later considered as a disgrace, few even call her a stepping stone towards her sister’s success. 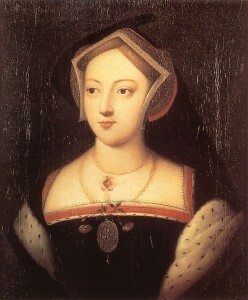 She was LADY MARY BOLEYN. It looks as if Mary Boleyn was forgotten after her sister took her place as HeneryVIII’s favorite. She belongs to the ambitious family of the Boleyn and the Howards. Her parents were Thomas Boleyn, 1st Earl of Wiltshire and Lady Elizabeth Howard, countess of Wiltshire. She is a descendent of King Edward I of England, from her maternal side and her paternal ancestors can be traced to George Boleyn, Mary’s grandfather and Lord Mayor of London in 1457-1458. Thomas and Elizabeth Boleyn had three children in all who survived to adulthood. They were – George Boleyn and sisters Anne and Mary Boleyn. Her sister Anne became the Queen of England and was later executed for adultery and treason. A similar fate was faced Catherine Howard, a cousin Mary Boleyn. There are debates over which of the Boleyn sisters is the elder one. The birthdates are also not accurate because infant mortality rate during those days were high and births of baby girls were not considered very important to note. Anne was sent to lower countries for education alongside regent’s ward, sharing same education. Thomas Boleyn was one of the three envoys assigned to the Netherlands’ court. Connections to Margaret, Archduchess of Austria helped him to secure this appointment. This is an important point due to which Anne is considered elder than Mary by few historians as elder siblings are given such privileges. But a very firm point which makes us change our opinion is that Mary was married before Anne. It was rather unlikely for a younger sister to get married before her elder sister, at least in those days. Later on, during Queen Elizabeth I‘s reign, Mary’s son Henry Carey, Lord Hunsdon asked for the Earldom of Wiltshire. This title belonged to his grandfather and he definitely would have been sure that his mother was older than the Queen’s mother, that is Anne, before asking for it. These are important points due to which Mary is considered elder to Anne. 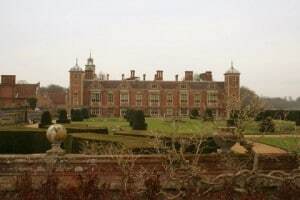 Whoever be the elder one Mary was born between 1500 and 1503 at Blickling Hall, Norfolk. 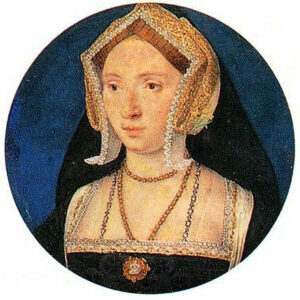 Usually, Mary was considered as prettiest of Boleyn sisters. She managed to catch the eye of King of England, France and also many countries. In her miniature, painted by Lucas Horenbout, we can see that she had brown eyes and cream complexion. She looks a bit on healthier side and from her medium brown eyebrows; we can assume that her hair would have been same color as well. She was taught French by Mademoiselle Semmonet. She was also well accomplishment at dancing, singing, embroidery, good manners, needlework and various other feminine activities. She studied music and could play lute, violin. Like every girl from a noble family, Mary was educated about her genealogy, grammar, history, reading, writing etc. She was also taught horse-back riding and hunting. Ref: Mary Boleyn by Lucas Horenbout. Mary Tudor for her marriage to King Louis XII in France. Few weeks later, many maids returned back to England but Mary was allowed to stay because Thomas Boleyn was the new English ambassador at France. Even after the death of Louis XII, she continued her stay in France and attended the new King Francis I’s bride, Queen Claude. It was sometime during this period of her stay in France that she and Francis I had their rumored affair. He called Mary his “English Mare” and boasted that how often he rode her. It was for this notorious action that Mary was sent back to England. After her return to England, she was appointed as a Maid of Honor to Queen Katherine or more often known as Katherine of Aragon. On 4th February, 1520, she was married to William Carey of Aldenham in Hertfordshire, a gentleman of the Privy Chamber and Esquire of Body to the King. Henry VIII too attended the wedding. Just after a year and a half of her marriage, in late 1521 or early 1522, she had a famous and royal affair with King Henry VIII. This affair was more of a setup by her father and uncle for the fulfillment of their ambitions than Mary’s own doing. It lasted till 1525/1526. During this brief period, she gave birth to two children. First was Catherine Carey, born in 1524 and second was Henry Carey, born in 1526. Both of these children are rumored to be illegitimate children of Henry VIII due to their striking physical similarities, but were not acknowledged by Henry VIII, like Mistress Elizabeth Blount’s son Henry Fitzroy was acknowledged as well as titled Duke of Richmond. The reason for this was that Henry VIII had started courting Mary’s sister Anne Boleyn and had plans to divorce Queen Katherine and marry Anne. Obviously, accepting Mary’s kids as his bastards would mean that he had illegal carnal relations with the sister of the Queen – to be, a mark no one would want on their character. At 22nd June,1528, William Carey died of sweating sickness, at the age of 28 years. Due to this untimely death of Mary’s husband and her children’s legal father, Anne was given the guardianship of Henry Carey. Henry Carey was educated by French poet Nicholas Bourbon. After Mary was widowed, not much attention was paid towards her remarriage. The Boleyns and the Howards were much engrossed in planning and plotting for the downfall of Queen Katherine and to make Anne the Queen of England. In 1532, Mary accompanied Henry and Anne to Calais on a state visit to France. It was probably here that she met William Stafford, a soldier and her future husband. On 1st September, 1532, Anne was declared as Marquess of Pembroke. Thomas Cranmer, Archbishop of Canterbury, declared Henry VIII’s marriage to Katherine of Aragon as illegal and invalid on 23rd May, 1533 and Henry VIII’s marriage to Anne, which was a secret ceremony, held on 25th January, 1533, as valid on 28th May, 1533. Her coronation was held on 1st June, 1533, which was very grandly celebrated. Few months later, on 7th September, 1533, Anne gave birth to Princess Elizabeth. Sometime in 1534, Mary married for second time to William Stafford. This was probably a love match as William’s financial status and social rank was well below that of Mary’s. Anne, or rather Queen Anne was furious to hear this news and banish her from court. Her family members, all intoxicated by the dose of their success, disowned her for marrying without consent. She was forced to beg to Thomas Cromwell to speak to King and Queen on her behalf as her financial conditions deteriorated. Though Anne helped her to improve her conditions, she refused to see or talk to her. This was the closest encounter between the two sisters, after Mary’s so called disgraceful act. her death on 19th July, 1543. She lived a simple life, away from the court, after the downfall of her family. Catherine Carey was married to Sir Francis Knollys on 26th April, 1540, and became Catherine, Lady Knollys. She had fifteen children in all. Mary’s son Henry Carey was knighted in 1558 by Elizabeth I and was thereafter known as Henry Carey, I Baron Hunsdon. His marriage to Ann Morgan resulted in the birth of twelve children in all. After the death of Henry VIII on 28th January, 1547, under the Act of Succession, 1543; Henry’s only surviving legitimate son Edward VI ascended the throne. But his reign was very short due to his untimely death. Then Lady Jane Grey ascended the throne according to her predecessor’s will but was executed after nine days for high treason. This gave her the title “The Nine Days’ Queen”. After that Mary I ascended the throne but died due to an illness in 1558. Then finally, Princess Elizabeth was crowned the new Queen of England. A Boleyn descendent was on the throne again and this time not through marriage but attainment under the Act of Succession, 1543. During her long Golden Age, she was very close to her maternal siblings, Mary’s children Catherine and Henry Carey. She ennobled Mary’s son and Catherine was chief Lady of the Bedchamber to Elizabeth. Henry also became Knight of the Garter on 20th April, 1561. Elizabeth was very generous to her Boleyn cousins as well as their children.